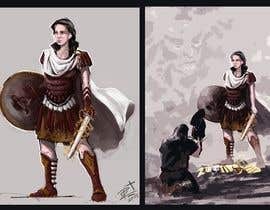 Illustrate Female Character "Ferra Romana"
This project is for my bosses daughter as a graduation gift. We want it to be awesome, able to be printed very large, and we want to retain all rights to the work and want it to be a private work, i.e. not be distributed to anyone but ourselves. This idea started out from my daughter and I watching Iron Man movies and her asking if there was a female corollary, and “Iron Woman”. Marvel had no powerful character of any lasting interest developed so we day-dreamed/brainstormed about “Antonia Stark”. Over the years my daughter became a latin scholar and the idea morphed into “Ferra Romana”. Ferra is an American citizen who is pursuing graduate studies in archaeology and classical mythology. She specializes in ancient Rome and is involved for a semester on a dig outside of Rome. She uncovers an ancient artifact that has a mystical connection to the goddess Juno. 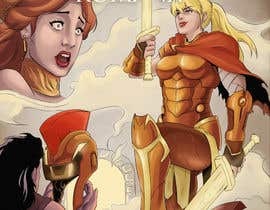 Juno appears to her and imbues her with powers and gives her special armor and compels her to become a human champion of Juno in her eternal intrigues amongst the Roman gods and goddesses. After Ferra has taken some actions on behalf of Juno she realizes that she had been under a spell cast by Juno and that she is a pawn in this game. 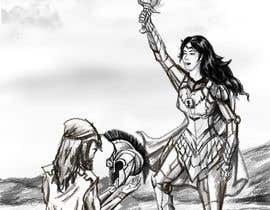 Ferra realizes that she will need some allies if she is to rid herself of the subjugation and fury of Juno. She uses her knowledge and wits to contact Vulcan and convinces Vulcan to help her out. She casts off the armor of Juno, in all its royal finery. 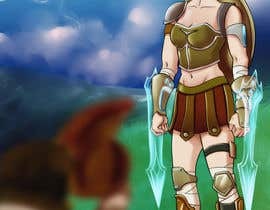 She chooses instead to put on the makeshift armor forged together by Vulcan and sets out on her quest to free herself from the tyranny of the gods. The character is called Ferra Romana. Ferra is a latin word for the feminine plural of iron and also a colloquialism for sword or two swords. Romana means “of Rome” or “Roman” or can be extended to mean “of War” or “Warrior-like”. 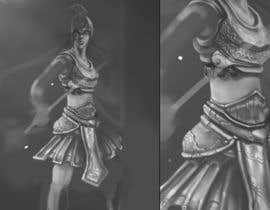 The original “Juno Armor” was very regal and elegant befitting a queen of the gods human champion. Bright, shiny, and royal. The “Vulcan Armor” is made up of various scraps from his forge and is kind of a hodge-podge mashup of leftovers and spares. 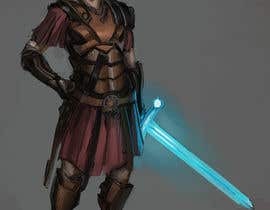 Playing off of Ferra’s name, he provides here with two gauntlets that at her willing project two mystical energy swords. She has a helmet that has a drop down magical visor that helps her to spot mythical/mystical/magical creatures, items, and beings. She has a shield that can attach to the back of her armor. This armor is a dull bronze and some components have a dark patina that leans towards maroon/purple. The armor should almost look like classical roman helmet and breastplate that has been modernized/iron manned/modernized. While we like that Ferra is a female super-hero, we don’t want the stereotypical over-emphasized comic book breasts, etc.. to be a distraction from the “functionality” of the suit. Ferra is to the right foreground quarter turned facing front left. Vulcan is to the left foreground, kneeling, quarter turned facing Ferra. He is holding up the helmet he made to hand to her. Ferra is standing on the discarded “Juno Armor” and is wearing the Vulcan armor except for the helmet. She has activated the dual gauntlet energy swords and is looking up/forward with an “I’m ready to take care of business” expression. In the background up higher is a cloud with some kind of visage of Juno looking shocked/concerned/wrathful. This “comic book cover” needs to be volume #1, Issue #8. 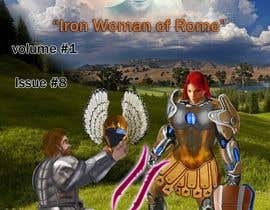 The comic is titled “Ferra Romana” and subtitled “Iron Woman of Rome”. The price needs to be 88 cents and the publisher is “ARCADIA Comics”. The back cover needs to be the poem shown below. We will frame the cover and the back cover portrait orientation side by side and this is how it will be presented to my daughter at her graduation dinner. Hi Please check my progress #19 . Hello there! I am currently working on this project and had two questions. First, what size format would you like this in? Second, do you have any appearance specifications for the lead protagonist, Ferra Romana? Thank you for your time! This contest sound like fun. If the contest holder was involved,so that the contest didn't scream ! !WAST OF TIME!! ,I would give it my all. I just wanted to know if you had abandoned the project. I don't suppose there is possible to extend the time limit? 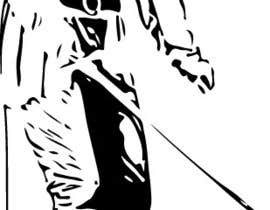 We have made some comments and rated current entries. Please see current entries for some ideas on where to start. #4 Please, leave your comment. It is worthwhile to continue working on the character?Really looking forward to. Thank you. Save your money, no need to seal, everyone can make their own entry "sealed"..
What Style do you prefer? is it posible for you to provide some samples of illustrations styles that you want? before i enter, when does the final thing have to be done for? Agreed. Especially since you also want to retain all rights including distribution the prize could be much much higher. I apologize I may have been unclear. 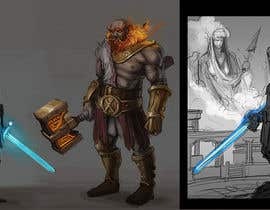 What we are looking for right now is a sketch with your concept of the character. The prize for this sketch is $100. I intend to offer whoever wins and maybe the runner up an opportunity to do the full project which we have set a budget of $1000 for. Thank you.